Since january 2009, Kyocera-Mita renews all its range by machines named "TASKalfa". 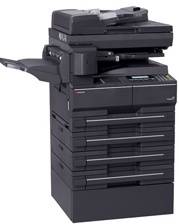 2 new MFP this Month : the TASKalfa 181 (18ppm) and the TASKalfa 221 (22ppm). Those machines are A3 B&W Multifunctions offer embedded stapler finisher in option. A B&W scanner and a fax can also be added if required, creating complete multifunctional devices.